For every East Village business that’s opening or closing, dozens are quietly making it. Here’s one of them: Barbara Feinman Millinery. Before she opened her East Village hat shop, Barbara Feinman spent twenty years working office jobs. “I was raised to be a smart Jewish girl who went to college,” she said. “Those girls aren’t supposed to use their hands.” But she burned out on white collar work, took a class at FIT, and decided to become a hat maker. 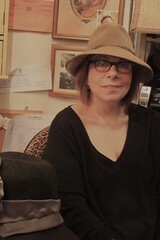 After initially working out of her kitchen, she opened Barbara Feinmen Millinery at 66 East Seventh Street in June of 1998. She recently told The Local how she has managed to make it to 14 years. What prompted you to stop working out of your kitchen and seek a proper storefront?